If anyone likes fish you’ll surely love this stew. 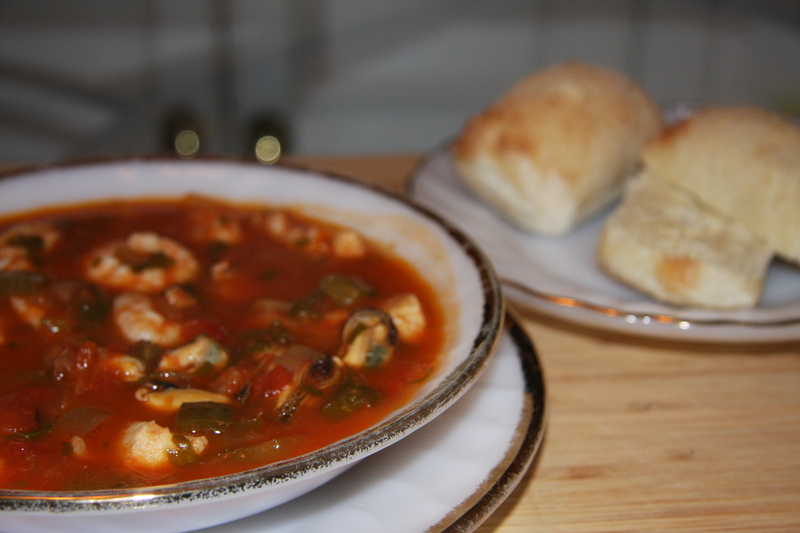 It’s not too often you get a recipe for fish stew. My friend V told me her husband J. J. makes this and they love it. After trying it I can understand why. It has so many of my favorite things in it. Fish, wine and tomatoes. Who doesn’t love wine? And J. J. also makes his own wine. Boy is it ever good! Used in a recipe it is tops. But not to worry you can use store bought. Just remember to use what you would drink. Good wine in a recipe is totally worth it. To get ready you will need 31-40 pieces of raw shrimp, 1 – 20 oz. 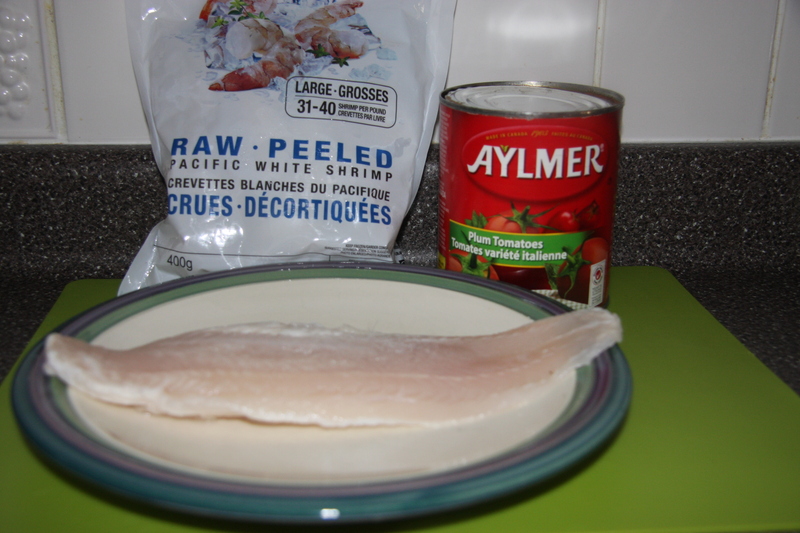 can of plum tomatoes and 1 to 2 pieces of white fish. This one in the picture is basa. 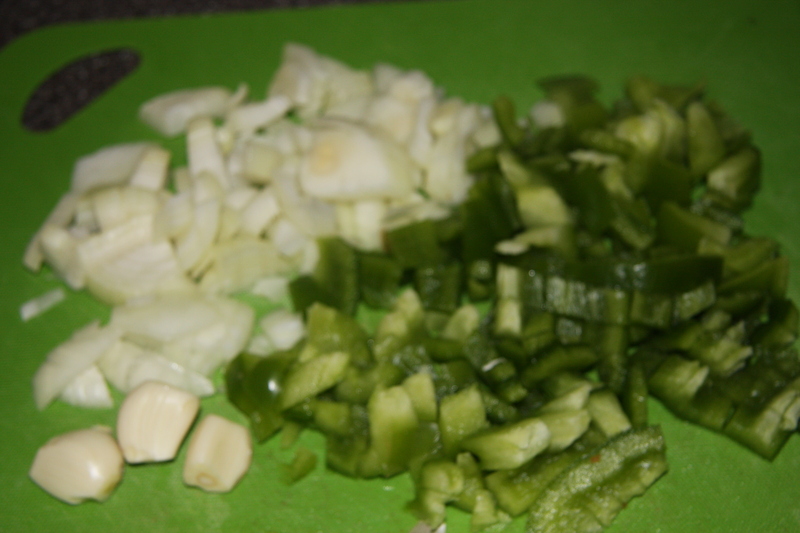 Next chop 1 onion, 1 chopped green pepper or you could use 1 chopped red pepper. Your choice. Place a little olive oil into a pan and fry the onion a little. 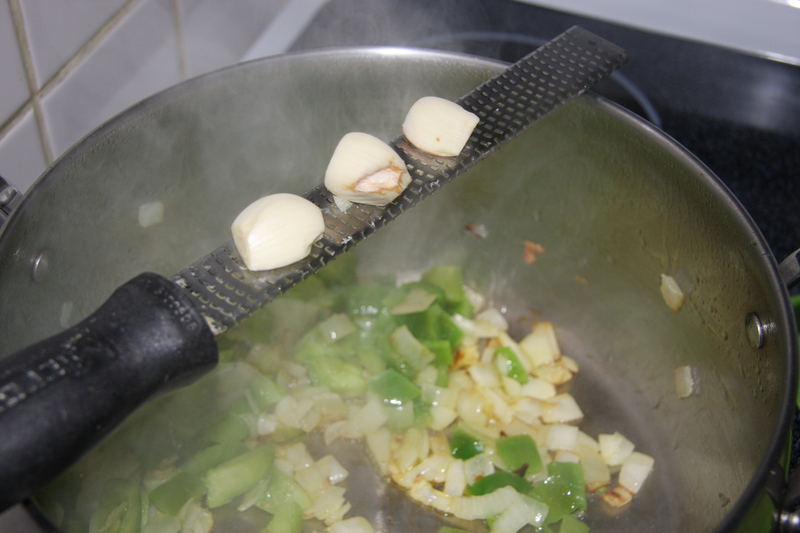 Add 2-3 cloves of grated garlic and fry a little more. Add 1/2 cup of red or white wine, or even apple juice if your not partial to wine. Boil this for about 3 minutes to remove the alcohol but still have that yummy flavor from the wine. Next add 1-28 oz. can of plum tomatoes with the juice. 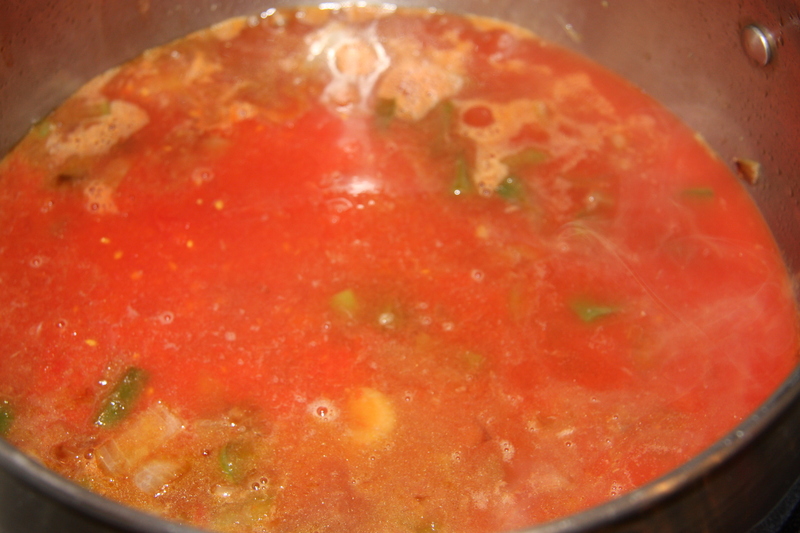 I like to squeeze the tomatoes by hand so you have ragged bits in the stew, along with 1/2 cup of chicken broth. Bring all of this to a boil and reduce the heat. Simmer it for about 1/2 hour. If you like you could add more liquid. Along with 1/4 cup chopped parsley. Next add the shrimp. Again, add as much as you like. Then add your favorite fish, that has been cut into pieces. I like to use a mild fish like basa or talapia. Last but not least add your mussels. Really this part is up to you. 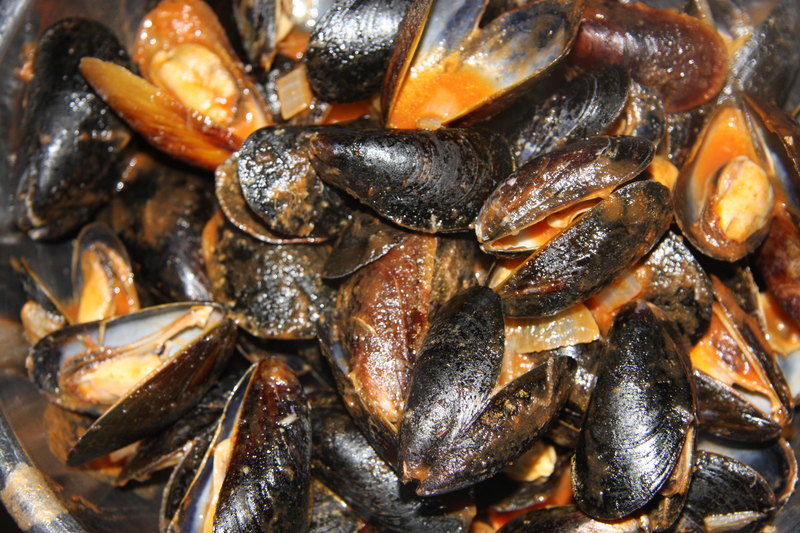 I cook fresh mussels in either white wine or tomato sauce then take the meat out of it’s shell and add it to the stew. About 1 cup. Or you can use a can of mussels. 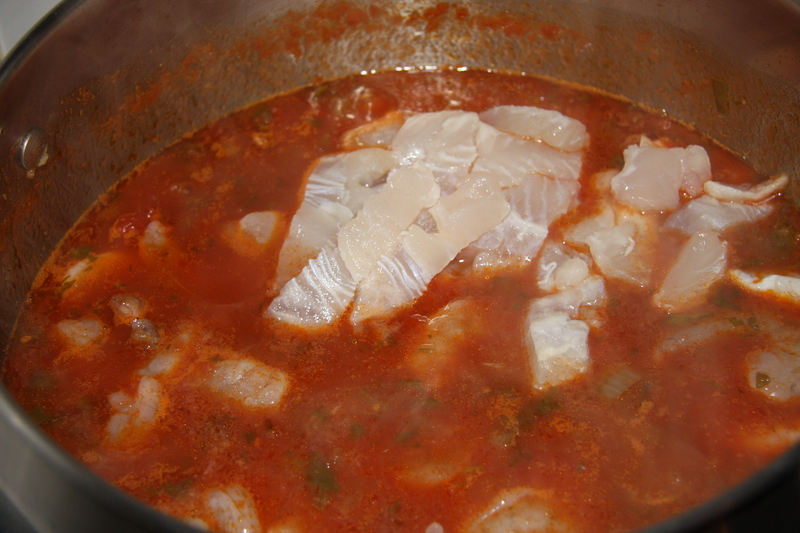 Bring all of this to a boil, reduce the heat and slowly for about 8 minutes cook the fish until it is done. You know for me the best way to see if it is cooked, is to taste it. This can also be served with al dente pasta added just before serving, so the pasta does not go really soft and mushy. Or you could add cooked rice. Both would be delicious. 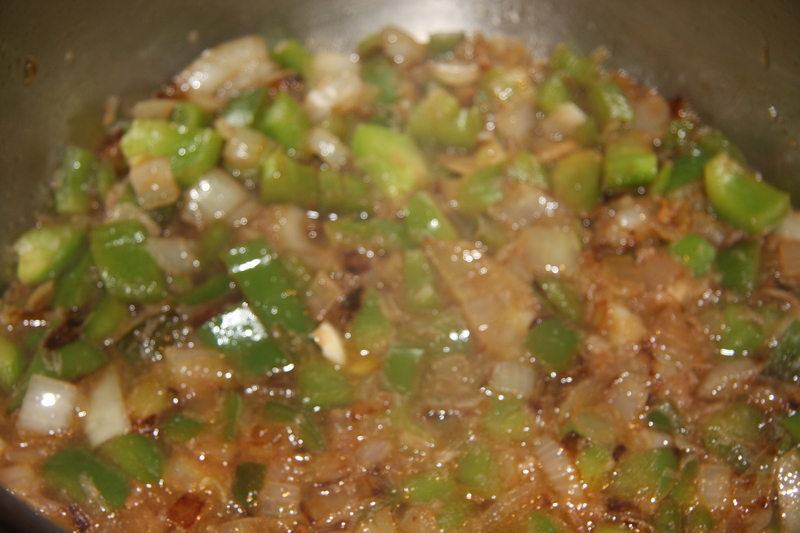 Fry onions, add the garlic and then the peppers. Next add wine boiling for 2-3 minutes to evaporate the alcohol. 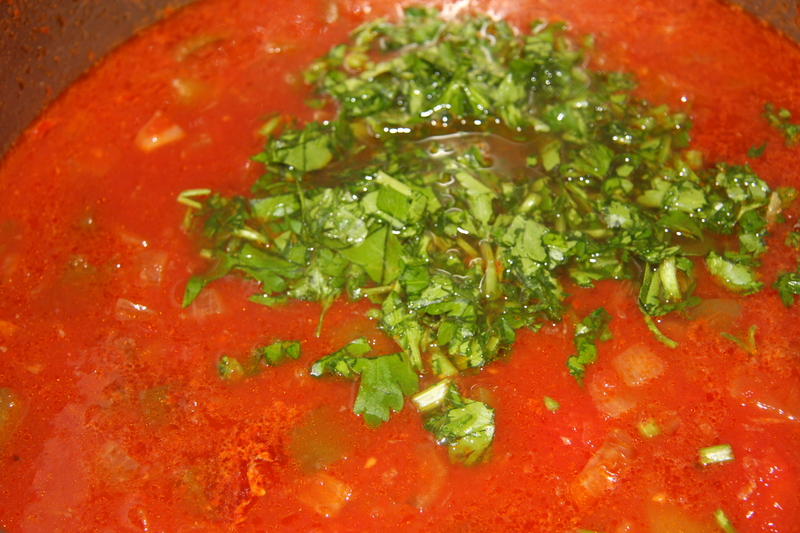 Then adding the plum tomatoes, chicken broth, parsley and salt and pepper. Bring to a boil, reduce the heat and simmer for 30 minutes, covered. In the meantime if you choose to make pasta or rice now would be a good time to do so. Just before your ready to eat add the fish that takes the longest to cook first. In my case it was the shrimp, then the basa and finally the mussels. Gently boil for approximately 8 minutes. Add pasta or rice into serving bowls and pour stew over top at this point. If you so wish. Easy to make, and it looks yummy.